I have a hearty respect for the crazily dedicated fans of 'Gunpla' - the intricately detailed Japanese model kits of the oodles of awesome Mobile Suits of the Gundam franchise. But this custom-made Gunpla model is so cool, I wish it had a series of its own. I've always been a big fan of mech-weaponry that is so absurd that not even the mech itself can merely hold it - that it has to be attached to a superfluous, mahoosive support frame to which your giant robot must be attached to in turn. 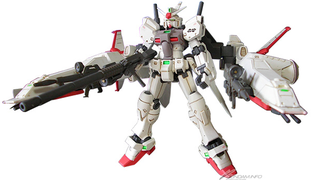 This one is especially cool as on top of having guns built into the support frame, there's just some goddamn giant guns attached to the sides too. And then Albion just carries its own rifle too, because NO ONE GIANT ROBOT CAN HAVE TOO MANY GUNS. Somebody get Gundam Albion his own anime, stat.